COTUIT, Mass. 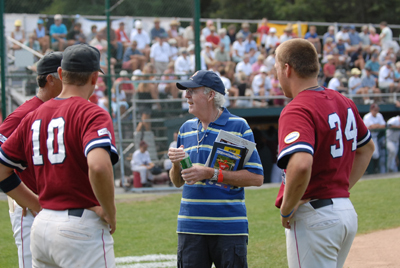 – Fans who have followed the Cape League this summer know what the Cotuit Kettleers have done thus far in the summer of 2006. Someone apparently forgot to tell the Wareham Gatemen, who stormed into Lowell Park and took the West Division Playoff series lead with a 1-0 victory, right under the watchful eye of the Cotuit fans. 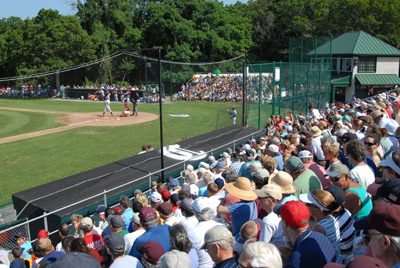 Huge Crowds at Lowell Park watched a Pitcher's dual. Those in attendance expected nothing less than a pitcher’s duel, and that’s what they got as two of the Cape’s best pitchers battled in a true test of wills. Despite a few minor mistakes, the game was flawless with players from both squads flashing some leather. The biggest play of the game came in the fourth at the hands of Brett Lilley (Notre Dame), who saved a few runs after making a diving stab to retire Wareham’s Seth Henry and then doubling up the runner at third to get out of a jam. That inning was also when the Gatemen did their damage against Cotuit starter James Simmons (UC Riverside), scoring the lone run of the game. Simmons pitched a complete game, scattering six hits and striking out five Gatemen. The big righty showed great command and poise throughout the game and seemed to get stronger as the battle progressed. Unfortunately, after such an impressive outing, he was credited with the loss despite pitching as well as his counterpart, Jeremy Bleich (Stanford). Bleich did get the victory, pitching seven strong innings and allowing seven hits. After the game, Bleich was all smiles, feeling fortunate to get a win in what was such a tight ballgame. as Joel Collins completes the double play. Battle he did. Cotuit had the bases loaded in the second inning with one out, but after just a few pitches, Bleich was out of the inning. After a rocky start, he was able to settle down and take advantage of an impatient Cotuit lineup that didn’t look like the league’s established top squad. In the late innings, Bleich was replaced by a stout duo of pitchers out of the bullpen. Martin Beno (Mississippi Gulf Coast CC) struggled in the eighth inning, just as Cotuit was doing everything in its power to give the hometown fans a victory. Catcher Sean Gaston hit an infield single, and he was followed by a beautiful bunt by Kellen Kulbacki, bringing the tying run even closer to home. Two batters later things were looking grim, but Jeff Rea was able to single and put runners on the corners with two outs. The crowd was roaring, and Cotuit fans could smell a comeback. But they weren’t ready for Nick Cassavechia (Baylor), who only needed three pitches to get out of the jam, striking out Tony Thomas Jr.
Peter Gammons before the game. In the ninth inning Simmons looked sharp, doing his best to keep the comeback hopes alive. Cassevechia was just too strong, however, and the Kettleers couldn’t muster a hit against the Wareham closer. 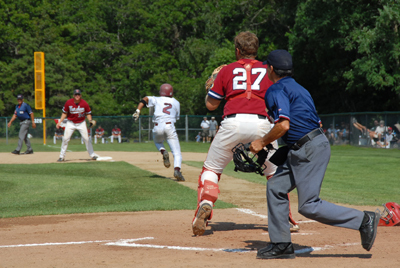 Cotuit finds itself in the same position as last year, down after the first game of the divisional series. Last year they found themselves on the outside looking in against Bourne, but this time around they will look to send the series back home for a deciding game. With the season this team has had and the attitude coach Mike Roberts has instilled in his boys, look for the Kettleers to put up quite a fight on Wednesday as they battle for their playoff lives at Spillane Field in Wareham at 7 p.m.